Sometimes necessity is the mother of invention, other times it is desperation that inspires. Take this salad. 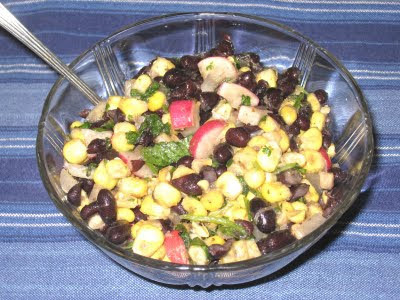 I had all the makings for a delicious black bean, corn and mango salad. I made the beans using a new technique that I am excited about and will share after I have tested it a few more times to make sure it really works and wasn't just beginner's luck. The corn was fresh off of a truck (which, to be honest, I suspect had to drive quite a way to get to Chicago, but was sweet and delicious regardless of its provenance). Unfortunately, the mango did not seem to want to cooperate. While it was soft on the outside and smelled nice and ripe, it was actually as hard as a rock and not sweet at all when I cut into it. Not quite ripe I don't mind, but this was too hard even to cut. I love the flavors of black beans and corn together, but they work best to me when they are played against a third equally strong ingredient that plays the two off of each other. Mango and tomato are my two favorite items to achieve that effect, but the mango wasn't going to work and I did not have any tomatoes. What was I to do? I had brought home too many ingredients from the Green Market the weekend before, as usual. One of the items I could not resist was a bunch of beautiful Japanese red radishes, which I had never before seen. Since one of my goals is to bring home something with which I am not familiar or which I have never before used, they had to come home with me. I used a few of them to make a Russian red kale and Japanese red radish frittata (doesn't that have a lovely ring to it? ), but I still had quite a few left and no real plans for them. 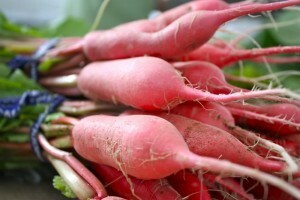 They are quite delicious, and slightly milder than the globe radishes whose bite makes for a delicious addition to a garden salad, but they still have that lovely radish flavor. The minute I thought of them I realized they would be up to the task and would balance out the black beans and corn beautifully. And I was right. They add a crisp, juicy, slightly earthy flavor to the salad that frames the beans and corn, neither overpowering nor being overpowered. In a word, delicious. Oh, I also didn't have any fresh jalapeno or serrano on hand. Cayenne added the needed heat nicely. Combine the first eight ingredients in a mixing bowl. In a small jar, combine the lime juice, honey and olive oil. Cover tightly and shake well. Add to the salad, along with the cilantro, and stir gently until everything is well mixed. Taste and adjust seasonings as necessary. Best when made ahead and brought to room temperature before serving.